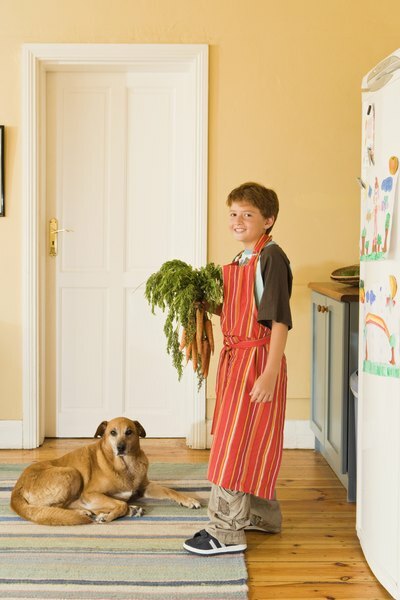 Pet parents can create healthy, homemade menu plans for their dogs. Dog parents will do just about anything to see their furkids thrive. This includes making sure their diets are healthy, balanced and delicious. When it comes to dog food, many options exist including using fresh meats, vegetables, fruits, oils and other ingredients to create homemade dog food diets. Why Choose a Homemade Diet? Creating a homemade dog food diet has many advantages. It offers pet parents reassurance about what goes into their dogs' bodies, and eliminates concerns about chemical usage, moldy grains, diseased animal products and non-nutritive fillers often found in commercial pet foods. Some people look to homemade dog food in an attempt to prevent or reverse health problems. Other pet parents simply want to move away from processed foods, replacing them with fresh, whole ingredients. Animal protein is the base of a good dog diet. Dr Greg Martinez, DVM, recommends home cooking and suggests creating a diet with 50 to 80 percent meat and organs. Alongside that, pet parents can strive for about 15 percent fat, including healthy oils. Carbohydrates have their place too, and a dog should eat about 25 percent carbs. This includes a range of vegetables, fruits, and starches. Dog parents can serve proteins, fats and carbs together or alone. Poultry, fish, lamb, bison and other meats are excellent choices. Beef is a possibility, but some dogs can't tolerate it. Eggs and yogurt can be served as complementary protein sources. When it comes to fat, most meats have it; adding oils like safflower, olive and wild salmon oils provides essential fatty acids that fight inflammation, increase immunity and improve skin condition. Dog-friendly sources of carbohydrates include vegetables, fruits, and starches like rice, potatoes and oatmeal. Adding a quality multi-vitamin and mineral supplement to your dog's diet ensures he's getting all necessary nutrients. When creating meals, avoid known toxins like onions, grapes, and avocado. If you're unsure about an ingredient, research it before offering to your pup. Cooking destroys bacteria and increases digestibility--especially important for dogs new to home cooking. Lastly, introducing new foods slowly--over a month or two--gives your dog's body time to adjust to the new and improved menu plan.